GRAND RAPIDS, MICH. (Sept. 21, 2015) — The Michigan Battle of the Buildings has been announced as a finalist for a Governor’s Energy Excellence Award in the category of Best Communication, Education or Program. 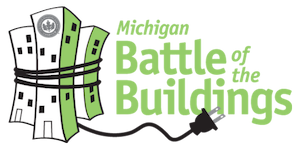 The Michigan Battle of the Buildings is a statewide competition — a Biggest Loser-style event — that allows Michigan businesses to celebrate their success in energy efficiency, as well as the thousands of dollars they save in lower energy bills. It is one a project of the U.S. Green Building Council West Michigan Chapter, a LEED leader whose mission is to transform the way buildings and communities are designed, built and operated in a way that improves the quality of life in West Michigan. An awards ceremony will be held Tuesday, Sept. 22, 2015, in Lansing.